I’ve received several requests to cover the outfit that James Bond wears during the Día de Muertos celebration in Mexico City, and I would like to also direct readers to the excellent analysis of this suit featured at Matt Spaiser’s site The Suits of James Bond, where Matt also developed an excellent digital reconstruction of the suiting that can’t be missed. Spectre kicks off the Bond franchise’s third consecutive collaboration with Tom Ford by outfitting Daniel Craig head-to-toe – or at least head-to-ankle – in new Tom Ford duds. This is a more complex take on the navy suit, white shirt, and blue tie outfit that 007 would later wear when confronting Blofeld in Morocco (link). 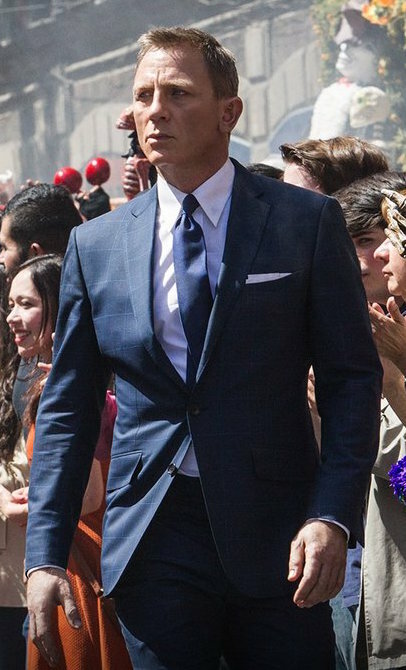 Bond ostensibly removes his black Día de Muertos costume to reveal a blue and black glen check Tom Ford “O’Connor” wool suit with a bold light blue windowpane overcheck, an attractive update of the overchecked glen plaid suiting that was popularized by Edward VIII when he held the Prince of Wales title in the 1920s and 1930s. Additional information and photos can be found at James Bond Lifestyle. Daniel Craig’s blue eyes and even the blue “eye” of his weapon’s laser sight are nicely called out by the light blue overcheck of his blue and black Prince of Wales check suit. The single-breasted jacket has a 3-roll-2 medium stance of blue horn buttons, and Bond keeps the middle button fastened throughout the scene. The narrow notch lapels – with a double-stitched silk buttonhole through the left lapel – roll down to the center button, showing only two buttons when the jacket is closed. Discarded Day of the Dead costume in hand, Bond abandons his surprised companion. Bond’s suit jacket is tailored to reflect the tight fit characteristic of Temime’s work in Skyfall and Spectre with a lean chest, suppressed waist, and short length. Since Craig keeps the jacket buttoned, it looks especially uncomfortable during the heavy movement of his stunt scenes when it strongly pulls at his waist, pulling apart the jacket skirts to expose a bright white shirt triangle above the low rise of the trousers. The suit jacket has straight and narrow padded shoulders with roped sleeveheads. The sleeves end with functioning 4-button cuffs, and Craig rakishly keeps the last button – positioned with the longest buttonhole – unfastened. There is a single vent in the back. Bond’s dapper approach to assassination. The flapped hip pockets slant backward. The gently curved breast pocket is a “barchetta” pocket, an Italian moniker evoking the pocket’s resemblance to a small boat. The barchetta pocket has Neapolitan origins but found its way onto prominent Americans of the early 20th century from Theodore Roosevelt to F. Scott Fitzgerald, as detailed in this elegant tribute from No Man Walks Alone. Bond folds a white linen handkerchief into his pocket. “Daniel Craig?! He looks like an upset baby.” – Jimmy on You’re the Worst. The matching suit trousers have a medium-low rise and flat front that gets plenty of screen time due to the many stunt sequences in this scene. The waistband is fitted with a wide extended tab in the front, a short split in the back, and a adjuster on each side that slides a strip of fabric through a small buckle. Since there’s no belt, Bond doesn’t wear his IWB holster. The side pockets follow the curve of the trouser seam to the front, and the jetted back pockets each close through a button. The trousers are fitted closely through the straight legs down to the cuffed bottoms which break high over his shoes. Bond’s white cotton poplin dress shirt is also by Tom Ford. It has a point collar, front placket, and back side darts that pull in the shirt to compliment the close-fitting suit. Perhaps once again forgetting his role as a secret agent, Bond fastens the shirt’s squared double cuffs with a pair of round silver monogrammed Tom Ford cuff links that have “JB” raised in silver over the blue face. Brass models of these 20mm cuff links can be purchased from Amazon. Bond grapples with a villainous helicopter pilot, flashing both his rakishly unbuttoned suit sleeves and his monogrammed cuff links. Not exactly flying under the radar, 007. Many outfits in Spectre evoked the limited color palette seen in the Connery era with ties chosen to match or reflect the suit and paired with white dress shirts, such as both blue suits, the black funeral suit, and the brown desert outfit. This outfit follows that system with a blue silk repp tie from Tom Ford. Craig channels Connery despite making a Moore/Dalton/Brosnan-style escape in a commandeered aircraft. Worlds collide! 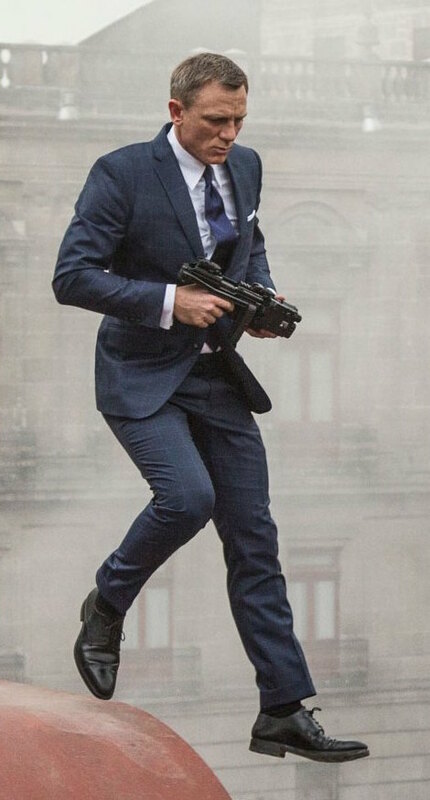 Daniel Craig’s Bond began wearing Crockett & Jones shoes in Skyfall and Spectre. In this scene, he wears the Crockett & Jones “Norwich” derby shoes (or bluchers) in black calf leather with five lace eyelets, a straight toe cap, and Dainite studded rubber soles. More information can be found at James Bond Lifestyle or the Crockett & Jones site. Bond somewhat disappointingly wears them with black dress socks as the short break of the trousers would have made this a better opportunity to continue the leg line with dark blue socks; perhaps he didn’t bother to change the socks from his all-black Day of the Dead ensemble. Situations like this are when one is grateful for a solid, non-slip sole on their shoe like the Dainite rubber soles on Bond’s C&J Norwich derbies. Daniel Craig has worn exclusively Omega watches during his tenure as James Bond, and his latest dress chronometer gets a fine debut in Spectre‘s opening sequence. The Omega Seamaster Aqua Terra 150M Master Co-Axial 231.10.42.21.03.003 was described by Omega itself as a “classic yet robust timepiece [that] represents a tribute to Omega’s rich maritime heritage,” making it the perfect choice for Commander Bond. The stainless steel watch has a 41.5mm case, presented on a a stainless steel bracelet. The sun-brushed, lacquered blue dial “recalls the wooden decks of luxury sailboats,” according to Omega, decorated with the Teak Concept pattern and embellished with a date window positioned at 3:00. The watch’s Omega Master Co-Axial calibre 8500 movement, visible through the transparent caseback, is resistant to magnetic fields greater than 15,000 gauss. You can learn more about this Omega watch and the others in the Bond series at James Bond Lifestyle. Similar watches can be found at Amazon, if you’re in the market for a Bond-style Omega. After Plan A fails, Bond is forced to develop Plan B: jumping into a helicopter. Luckily, his trusty Omega can withstand it all. For more about this outfit and its accessories, check out James Bond Lifestyle’s portal. If you want to read more about the Day of the Dead costume that Bond initially wore over this suit, read The Suits of James Bond’s excellent post from yesterday. Daniel Craig’s 007 proves that a limited color palette doesn’t mean boring and that a classic suiting pattern doesn’t mean outdated. Iconic Alternatives has a great rundown of affordable options for gentlemen interested in channeling Bond’s made-to-measure Tom Ford look. James Bond arms himself for his unauthorized assassination mission with a Glock 17 fitted into a FAB Defense KPOS Carbine Conversion kit as confirmed on IMFDB. This kit allows the user to take a full-size semi-automatic pistol – preferably a third or fourth generation Glock but the site also describes two allowable SIG Sauer models – and transform it into a PDW (Personal Defense Weapon). 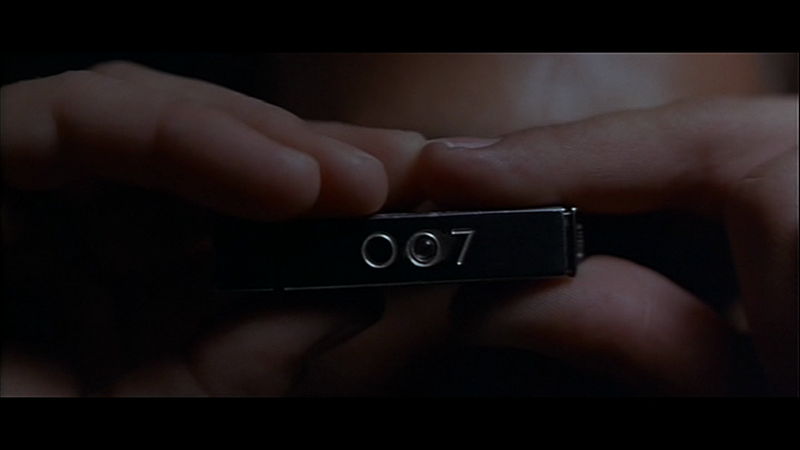 Bond fits his converted Glock with a suppressor and blue laser sight. More information about the FAB Defense conversion kit can be found at their site. Great suiting and a great colour on Craig. I still think personally the fit is still too tight on Craig. Tom Ford’s suits aren’t supposed to fit as close as this. The suits in Skyfall and to a lesser in extent Spectre aren’t classical proportioned. The pants are very tight, I know it a fashionable look, but I think it will date a lot of the suits in years to come. I have to agree with Ryan, the new suits by Ford are cut way to tight. I think this would be a hindrance in a job like Mr. Bond’s. Tom Ford doesn’t make the O’Connor model as skinny fit as Craig wears. He would ask for it that way. I’ve worn an O’Connor fit Ford suit and I wear a size 38 the same size as Craig apparently wears in Skyfall and Spectre. It fits me perfectly without being really tight, but it is still slim fitting. Craig really needs a size 40. I believe that’s a back-translation and that both are correct to use. I had seen both used so I consulted Wikipedia as it appeared to be the only resource at my disposal that explored both naming conventions: https://en.wikipedia.org/wiki/Day_of_the_Dead. P.S ..isn’t it Edward VIII, not VII…? Thanks, Simon! You’re absolutely right – good eye!